I compared the first level first screen between the game on NES an emulator and they use different tile placement, its not of just another page of memory or something. So not perfect yet, the enemy placement, sprite and movement is correct. But background graphics and obstacles are placed differently. Hmm. I wonder what could be the problem then. It plays from the cartridge, just doesn't dump properly. It is a proto, however. It will also not load at all in the emulator (FCEUX 2.2.2). Post a screenshot of you anago gui and let me see how you set all. Seems to work correctly if I fix the nametable mirroring. (It should be Vertical, not Horizontal). I thought that the Kazoo detected that, but who knows. ... PM me the broken image? In summary, omitting the write to 0xFFFF flips the two PRG banks around. No idea what it'd do if there were more PRG banks, as on Strike Wolf. Does it matter what value is in cpu_write(d, 0x4100, 0);? Currently the game writes 0; what happens if it's 0x10, 0x20, or 0x30? Does it matter what value is written to 0xFFFF? Do the address lines matter at all, other than ≥ 0x8000? Does it matter what the address lines are in cpu_write(d, 0xFFA0+i, (i<<4));? e.g. what if it were 0x8000 instead of 0xFFA0+i ? Its not a game I am collecting so unfortunately I cannot test it. But great work man getting the policeman working. I have not been able to find this rom anywhere online so its really nice to have it dumped. I'll get back to you tomorrow. I got to pack it in for tonight. Thanks again. Same here, will continue with this tomorrow, not in reach of stuff. Seems not to matter, 0x10, 0x20, 0x30, 0xFF all works. Value seems not to matter, 0x0 is ok and so is 0x5a. All addresses >= 0x8000 seems to work. 0x7FFF or lower gives the same result as removing the line. Also works, 0x8000 and 0x8000+i works just as good. Does anything happen if you have multiple cpu_write(d, 0x4100, whatever); in a row? Does anything happen if you have multiple cpu_write(d, 0xFFFF, 0xFF); in a row? Could you measure the voltage on 05-00002-010 pin 3 = PRG pin 1 while you're dumping the game? It should either be high then low, or low then high. But I don't know if unagi will throw a fit for having 2500 bytes here, rather than a nice power of 2? Thanks for having the patience and/or curiosity to actually figure out what's going on, even though you already have a functioning dump! Nope, works just as good, tried up to five writes. Start at 5V after reset of Kazzo, starts dumping and it switches to 0V, half way through the PRG it goes back to 5V. If I remove the cpu_write(d, 0xFFFF, 0xFF); line it will have the reverse behavior starting at 5V when you start duping and go to 0V after half the PRG. Sorry for the delay, had some real serious things to handle. Not too clear, but most settings are default exactly the way they are when the program is first downloaded. The only thing gets adjusted is of course the script. 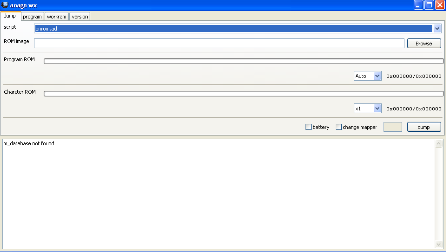 the colordreams script is available in the drop-down list. Very unclear, I do not know how you made such an unreadable screen shot. Anyway, looks like you set the CHR ROm to x1, the memory is larger than that on moon ranger so try to set it to x4. Really glad there's progress on supporting mappers with this device.